Fundraiser by Cathi Comar : Help us give Brodie a Second Chance! Help us give Brodie a Second Chance! Meet our pittie-mix, Brodie. He is a one-year-old, healthy canine who inherited all of the sweet personality traits of his mixed breeds, but, unfortunately, he has also acquired some bad orthopedic genetics. You can't tell by this photograph or by his happy demeanor that Brodie is in constant and chronic pain; both of his back legs are in terrible condition and he suffers with luxating knee caps compounded by the rotation of his tibiae and femurs. He was surrendered to our animal shelter because his owner's knew that they couldn't afford the 2 and possibly 4 extensive and expensive surgeries that Brodie needs in order to live a normal life. At Second Chance Animal Center we truly believe in second chances, and we need your help to secure that chance for Brodie. We have consulted with four veterinarians, and we are working with an orthopedic surgeon who can provide the care and surgeries to correct Brodie's debilitating condition. 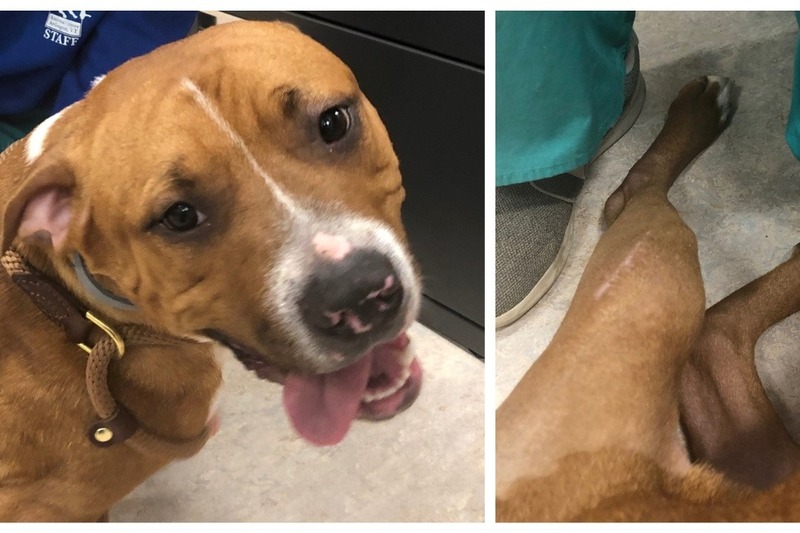 He initially needs 2 surgeries, totaling $9,000, to correct his luxating knee caps; this cost includes these 2 surgeries, additional x-rays, medications, full evaluation of his ACLs, as well as post-operative care and treatment. But wait, there is possibly more! After these initial surgeries, Brodie will be re-evaluated by the surgeon 4 months later. Because both hind legs are severely bowed, there is a strong possibility that the bowing will continue to cause the knee caps to luxate. Another 2 surgeries will then be necessary to replace the bowed sections of his femurs with metal plates. These surgeries are an additional $14,000. That's a total of $23,000 to help this canine, however our immediate need is to raise the $9,000 to cover Brodie's knee surgeries. Why do this for Brodie? Well, it's the right thing to do for a young, happy, and otherwise healthy dog. 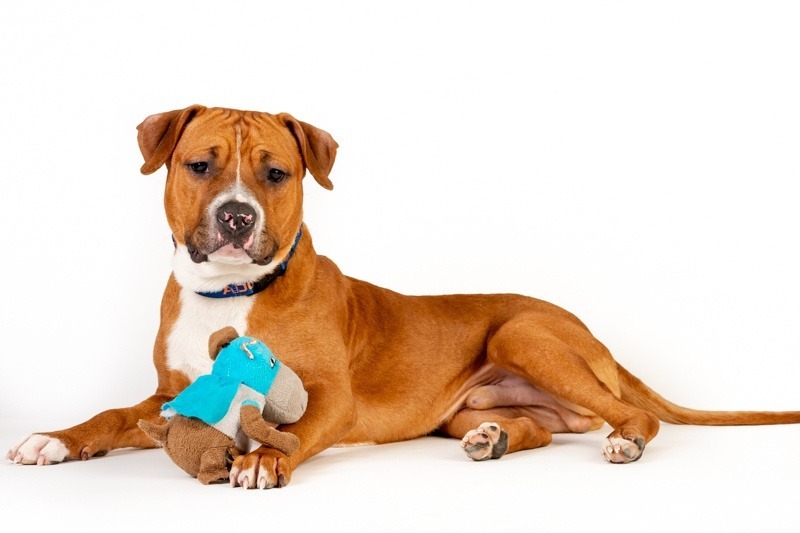 Brodie is a stellar ambassador for the American Shelter Dog, and we cannot adopt him to a loving forever home until his orthopedic conditions are corrected. Because we believe in second chances, we will do our best to do what it takes to provide him with a long and pain-free life. Won't you please support our efforts to help this deserving canine? We do have some operating funds allocated for emergency veterinarian care and off-site surgeries, but Brodie's needs far exceed our budget allocation for this year. Beside this GoFundMe campaign, we are also organizing fundraising efforts throughout our community to augment this online giving. We plan to post updates about Brodie's progress throughout the next few months, including new photographs and videos. His charming nature is sure to win your heart! Brodie visited Dr. Fitzpatrick this week, and his right-leg surgery will hopefully be scheduled in 4-6 weeks. His left leg is healing nicely, and the knee is stabilized! Brodie can now go on ten-minute walks between kennel rest periods. We are so appreciative of your support! Brodie stopped by today for his 2 week post-surgical suture removal - and he's got energy to spare. He's on track for surgery on his left knee in early April. Great news! We are thrilled to show you Brodie after his first surgery; this was taken 24 hrs post-op. He is now in his foster home, getting his sutures removed tomorrow and then going for a re-check on 4/8/19 with Dr. Fitzpatrick. Overall he's doing incredibly and his foster family report that he's now "toe-touching" with his left leg and enjoying his physical therapy sessions!